After four bumper auctions in a row, prices fell at the latest Global Dairy Trade auction. Average prices paid at the auction fell 3.1% on the last event held three weeks previously which itself was up 9.9%. The previous three auctions had seen double-digit increases for dairy prices. 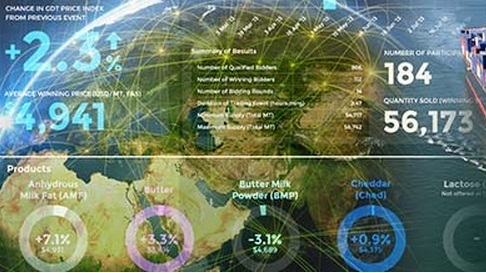 This week, key products Whole Milk Powder and Skimmed Milk Powder both fell at today’s auction down 4.6% and 4.5% respectively. Fonterra’s milk collection across New Zealand in September was 8.7% lower than September last year and for the four months to September 30, it was 5% behind the same time last year. According to the co-op, dairy farmers in New Zealand continue to reduce stocking rates and supplementary feed to help reduce costs in the low milk price environment. 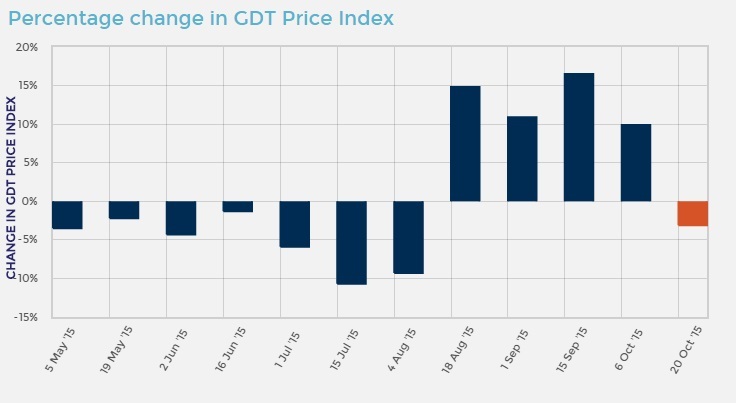 According to ICOS’s latest dairy trade commentary, there are now reasonably consistent signs of a strengthening in dairy markets. It says with the EEX index for butter and SMP both rising steadily across the past month. Butter quotes, at €2872 are running at over €150 up on the month and the SMP quoted price at €1762, although still close to intervention level, is running around €100 up on last month. Those prices would value milk at around 22-23c per litre, still well below current milk price levels, but moving slowly upwards none-the-less, it says. ICOS comment that this relative strength is undoubtedly down to buyers concern that milk supply growth is slowing down, as it appears to be across all the major regions. The post quota supply growth in the EU, which came from “2nd tier” nations, such as Ireland, Poland, the UK and the Netherlands, is expected to tail off as the year progresses, and, crucially, the big producer nations such as France and Germany are seeing production declines. The US is expected to see around only 1.4% growth for the year, and New Zealand, is also in decline, it cites.